ALL NACHOS COME WITH CHEESE SAUCE ON TOP. Grilled chicken or steak with onions, peppers and tomatoes. You may choose beef or chicken. 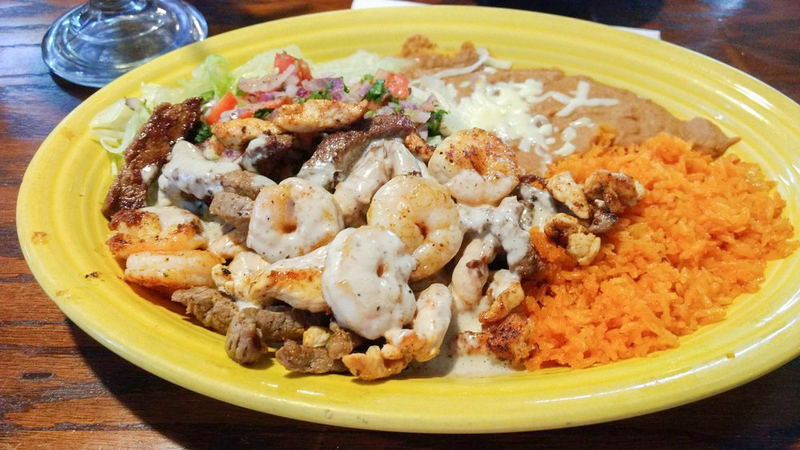 All combos come with rice and beans. Three enchiladas: one cheese, one bean, and one spinach, topped with cheese dip and rice. Served with guacamole salad. Grilled chicken breast, topped with spinach and cheese sauce. Served with rice and steamed vegetables. shrimp cooked with bell peppers, onions, and tomatoes, served over rice, topped with nacho cheese sauce. Your choice of steak or chicken, with bacon, bell peppers, onions, rice and black beans. Smothered in melted cheese and served with lettuce, tomato. and sour cream. 10″ burrito stuffed with shrimp, crab meat, onion, and tomatoes, topped with creamy cheese sauce, and served with your choice of beans or rice. Available daily until 2:30 pm. a flour tortilla stuffed with steak and onion, smothered with nacho cheese, and served with rice, beans, lettuce, tomato, and sour cream. *this item may be served uncooked. Consuming raw or undercooked foods such as meat, poultry, fish, shellfish, and eggs may increase your risk of food-borne illness. To our guest with food allergies or sensitivities, we cannot ensure that menu items do not contain ingredients that might cause an allergic reaction.